Compatibility: "Convert to an Office Open XML File Format"
I have converted a .ppt presentation to a presentation in Office Open XML File Format (.pptx, .pptm) using the Convert function of PowerPoint 2007 or later. 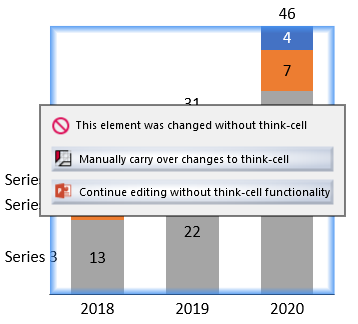 After clicking on a think-cell chart, I receive the message This element was changed without think-cell. For each chart, please select the option Manually carry over changes to think-cell. For more details about this dialog please refer to our manual. To convert .ppt into .pptx presentations without encountering this problem use Save As instead of Convert. Most think-cell charts are based on MS Graph charts. The PowerPoint Convert feature converts all MS Graph objects into Excel Chart objects similar to manually editing think-cell charts. As a result, think-cell charts cannot connect to their MS Graph objects anymore and above dialog is shown.